Laren J. Garfield, D.D.S. was born in Chicago, Illinois. He has been married for the past 30 years to Marlene and they have two children, Jennifer and Jared. In 1974, Dr. Garfield graduated from the University of Illinois Champaign with a Bachelor of Science in Biology. He then went on to the University of Illinois Dental School from 1975 to 1979. His first practice was located in Chicago, where he was also on staff at Mount Sinai Hospital. Since 1991, Dr. Garfield has been located in his Buffalo Grove office on Arlington Heights Road. 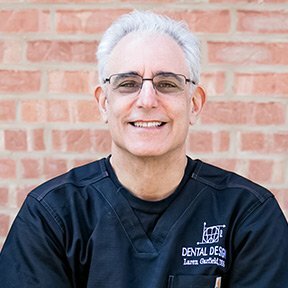 Dedicating his professional life to dentistry, Dr. Garfield has participated in over 1,000 hours of continuing education courses to enhance his practice in the areas of crowns and bridges, veneers, implants and cosmetic dentistry. Dr. Garfield believes education is of paramount importance in order to provide the highest standard of dental care. Dr. Garfield is an active member of the American Dental Association, Academy of General Dentists, Chicago Dental Society, Illinois State Dental Society as well as the Seattle Study Club.